On Tuesday, Belgium's capital Brussels was rattled by a series of bombs detonated first at the city's international airport and 75 minutes later in Maelbeek metro station, a transportation hub located meters away from the European Union headquarters. It has not been confirmed whether the three separate explosions — two in the airport and one in the metro station — were coordinated. According to Belgian media, CNN reported, at least 26 people have been reported dead and dozens more have been injured. Airports and subway stations have been evacuated, but travelers and residents are still extremely shaken. Update: A series of coordinated blasts in Belgium, two at the city's key airport and another at a busy subway station, are thought to be terrorist attacks. At least 25 people are believed to have been killed. The horrific attacks came just four days after Belgian authorities captured Salah Abdeslam, a fugitive believed to have been involved in the November 2015 Paris attacks, which left France in an extended state of emergency that has not ended. Since the deadly attacks, Belgium, the nation where the Paris attacks were reportedly planned, has been the subject of police raids. Abdeslam allegedly aborted his mission after his fellow ISIS conspirators killed themselves in November's suicide bomb attacks. He fled from Paris to Belgium, where he hid in a safe house for four months until being discovered by Belgian authorities on Friday. In response to the threats, which could have been retaliatory, Belgium heightened its security level from three to four, giving the green light to deploy army personnel on the streets. 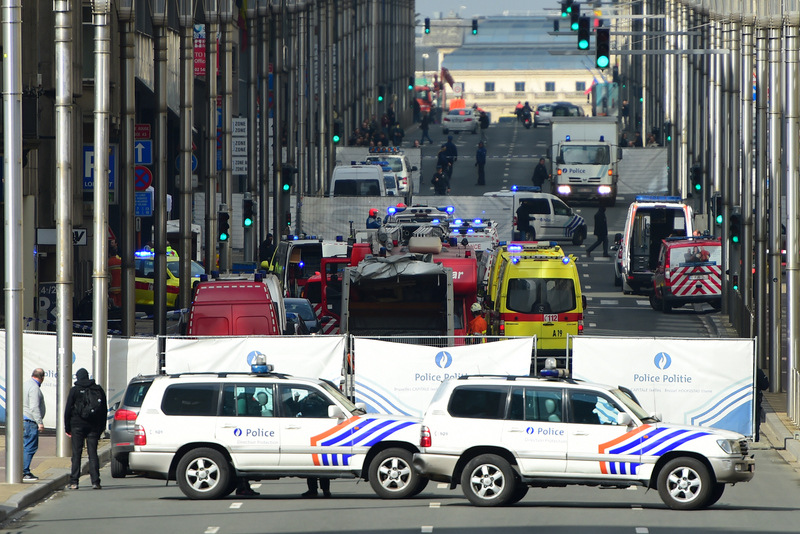 Though it has yet to be confirmed, Belgian federal prosecutor Frederic Van Leeuw said there is reason to believe the series of bombs was a terrorist attack. According to him, one of the explosions was likely set off by an unidentified suicide bomber. Belgian Prime Minister Charles Michel delivered a statement on Twitter following the attacks. We are following the situation minute by minute. The absolute priority goes to the victims and to people present at the airport. Later in the morning, Prime Minister Michel announced another message and asked his nation to remain calm. What we feared has happened, we were hit by blind attacks ... we realize we face a tragic moment. We have to be calm and show solidarity. These photos help to convey the chaos and panic happening in the streets of Brussels after the city's unassuming morning commute was so atrociously interrupted. Every person around the world — in Belgium or not — has his or her own beginning of the day routine that is pursued without a second thought. To instill fear in those most ordinary, seemingly safe, and everyday motions is truly terrorizing.